Another London nighttime landmark has closed, following the final weekend of Turmills - the famous club in Clerkenwell. The final record to be played last Monday afternoon was apparently Blue Monday by New Order. Landlord Derwent London is planning to convert the building into an office block. Turnmills opened as a wine bar in 1985 and came into its own as a club from 1990 when it became the first in the country to be granted a licence to open 24 hours a day all year round. 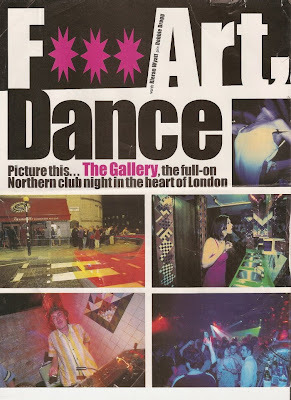 In the mid-1990s it became home to groundbreaking gay nights Trade and FF and then to the Friday house night The Gallery, which started in July 1994 and featured DJ 'Tall' Paul Newman - whose dad John Newman owned the club. I spent some happy nights at The Gallery and techno club Eurobeat 2000 which was also held there for a while. 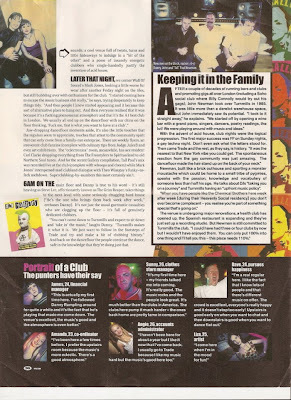 The pages reproduced here are a hyperbolic article about The Gallery from Muzik magazine (July 1998 - click on them to read) which described it as 'the full-on Northern club night in the middle of London' on the basis of it being an attitude-free night of full-on hedonism in 'a cool venue full of twists, turns and little hideways to indulge in a "bit of the other"'. It is true that the dancefloor wasn't massive, but it didn't matter as there were speakers all over the place and people danced wherever they happen to be standing, by the bar or the pinball machine as well as on the dancefloor proper. There was also a gallery overlooking the main part of the club. I remember sitting up there on The Gallery's first birthday night in 1995, watching Boy George (who is a tall bloke) walking though the crowd in a T-shirt saying "Hate is not my drug", shaking hands, and heading into the DJ booth to announce himself with Lippy Lou's Liberation, followed by a stampede to the dance floor. I remember wearing a silver sparkly top, girls with fairy wings and a man walking into the toilets wearing a dress and offering round a bowl of bonbons (at Easter 1996 they also gave out chocolate mini eggs at the door). Musically I remember pumped up mixes of disco classics I Feel Love and Do you wanna Funk, Insomnia by Faithless and more than anything else bouncing around under the lasers to Access by DJ Misjah & Tim. In his book, London: The Biography, Peter Ackroyd mentions Turnmills, seeing it as an inheritor of Clerkenwell's historic reputation for disrespectful nightlife and more broadly as 'the harbour for the outcast and those who wished to go beyond the law'. For Ackroyd, these continuities in London life 'suggest that there are certain kinds of activity, or patterns of inheritance, arising from the streets and alleys themselves', a kind of spirit of place which he has referred to as a 'territorial imperative'. Whether this spirit of Clerkenwell will withstand property developers remains to be seen. Derwent London at least seem intent on exorcising the ghosts of Clerkenwell radical and salubrious past, stating that their business is 'to improve the desirability of people coming to these buildings'. 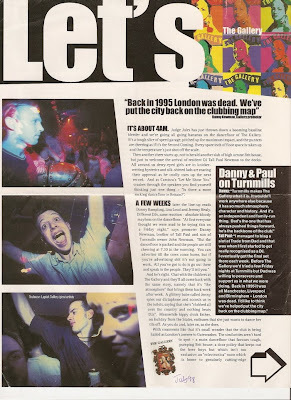 We had moved from the Picadilly Hotel Basement to Limelight on Shafestbury Ave, Club UK Wandsworth, EC1 Club (Now Fabric) Farringdon, Eurobeat2000 had its longest run at Turnmills.